Are you looking for a tree? If you aren’t yet, it’s highly advisable that you begin your search now, before it’s too late. After all, the flowers of the fruit trees will eventually give way to spherical edibles, by which point you won’t be able to make that once-a-year brachah called Birkas Ha’ilanos. Although one can technically make this brachah at any point in the year upon seeing a flowering fruit-tree, it seems widely accepted that it is only recited during the month when the smell of cleanser abounds and rugs are being beaten at the decibel of a shotgun. Yes, Nisan is here, and with it — in addition to all the Pesach cleaning and preparations — the opportunity to acknowledge Hashem for the fact that He has created beautiful creations for our benefit. Interestingly enough, there is a talmid chacham by the name of Rabbi Pinchas Cohen, whose entry exam to Yeshivas Kol Torah was a single question about Birkas Ha’ilanos. Roughly two decades ago, when Pinchas Cohen was a young bachur from Teveria graduating from yeshivah ketanah, he decided that he wanted to attend Yeshivas Kol Torah for yeshivah gedolah. He spent the weeks leading up to his exam studiously reviewing Perek Merubah, the seventh chapter of Masechta Bava Kamma that deals with intricate monetary laws pertaining to theft, transfer of ownership, and so on. And he didn’t just make do with knowing the Gemara, Rashi, and Tosafos perfectly; he carefully studied numerous deep and intricate commentaries and expositions of many Acharonim, such as the Ketzos HaChoshen, Nesivos HaMishpat, and even the Kovetz Shiurim and Shiurei Rav Shmuel. In other words, Pinchas Cohen had Perek Merubah down pat. Of course, Birkas Ha’ilanos is practically the last thing you would think has to do with any topic discussed in the seventh chapter of Bava Kamma. It was a “thinking question,” to say the least. But Pinchas Cohen did not disappoint. When Rav Diskin returned, he had a ready answer. “The Gemara says that there were pious people known as ‘the modest ones’ who would go out of their way to mark their orlah trees so that people would not accidentally violate the prohibition of eating orlah fruit. But Rabban Shimon ben Gamliel held that this is unnecessary. Someone who would take another’s fruit without permission is committing an act of theft, Rabban Shimon ben Gamliel reasoned, so there is no reason to go out of your way to prevent such a person from eating forbidden orlah fruit. From this we see,” Pinchas asserted, “that one is indeed allowed to recite Birkas Ha’ilanos on an orlah tree. For if it would not be allowed, then that would be enough of a reason to mark one’s orlah trees, to prevent people from erroneously reciting Birkas Ha’ilanos on them!” It goes without saying that Rav Diskin was eminently pleased by the response. Now, notice that Birkas Ha’ilanos is squarely ensconced in “chodesh ha’aviv” — the month of Spring. It’s no coincidence that Birkas Ha’ilanos is assigned the same month as Pesach which always, as the Torah explicitly states, has to fall out around Spring time. 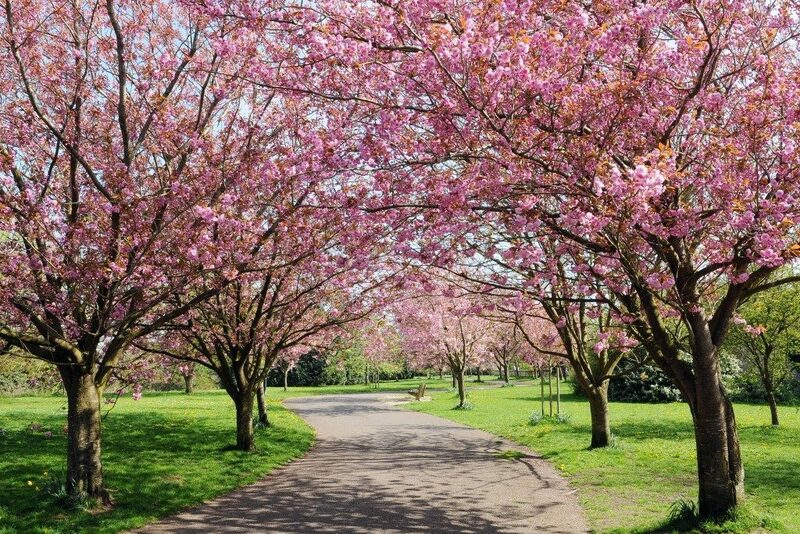 And there is perhaps nothing that better manifests the bursting back to life of Spring than the beautiful blossoming of fruit trees. In Mitzrayim, the Jewish People were under a chokehold, their power and potential held captive under a brutal, oppressive yoke of slavery. In a sense, they were like an orlah tree that is incapable of giving forth anything useful or productive. The fruit of an orlah tree are slated for destruction, as were endless numbers of Jewish children born in Mitzrayim. Pesach, the festival of redemption, was the birth of the Jewish nation, when its life force finally burst forth and blossomed, its spirit free at last to grow and soar. Birkas Ha’ilanos expresses our appreciation of the captivating beauty inherent in the gushing forth of life, the materialization of great potential. And yet, even in trees that are apparently still barred from usefulness, there is beauty to be seen. For, ultimately, in every creation or situation that Hashem has wrought, there is endless beauty to be perceived and appreciated.